I use DNA every day of my life. Not only do I use it personally, but I utilize it for my clients. I love what it can do for us – but DNA is only a tool. A tool on a path – a path to your ancestors. But ancestors lead us to cousins. DNA is about cousins, finding them, getting to know them and then, yes, loving them. I know, you guys are all cringing now about the L-word and searching for the little X to close this screen. But it’s true – it’s about people – connecting to other people – both dead and alive. Maybe I discovered early the value of cousins since my own immediate family was so small. To connect, I had to reach out. I’ve been so very fortunate. 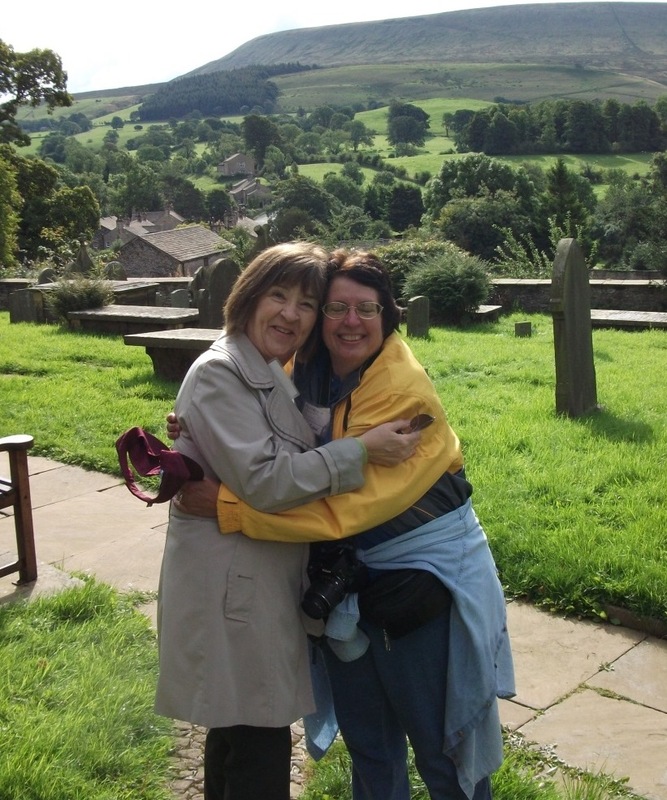 This past month, on a trip made possible by DNA (which I will be writing about shortly), here I am in the churchyard in England where our Speak ancestor’s family lived in the 1600s, with my cousin Mary. I love her, dearly. And this is my cousin, Daryl, my sister of heart and my research travel companion. I met her through genealogy too, about a decade ago. 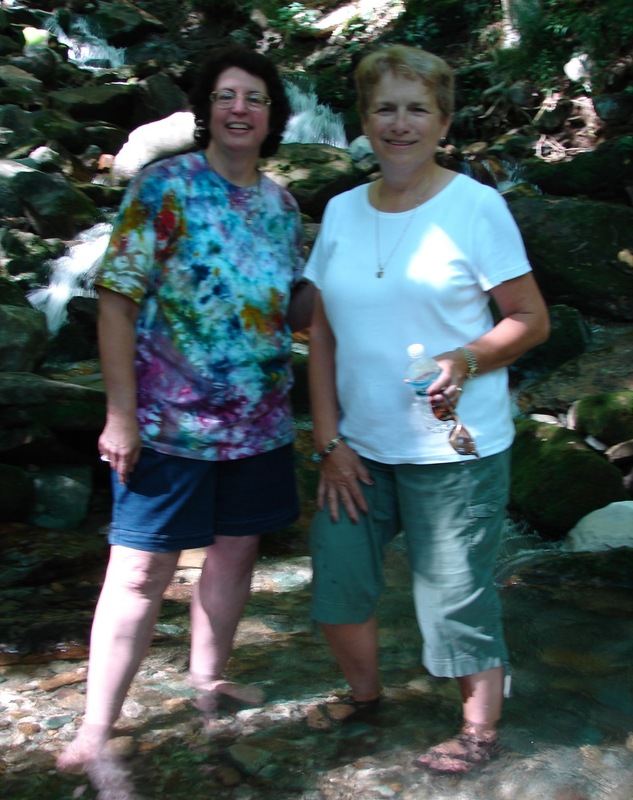 Here, we’re wading in the creek descending from the Cumberland Gap, running through the Dodson ancestral land, on a very hot summer day during a research trip. DNA has taken us on an amazing journey that we never expected. We connect through the Dodson line. And here in a slightly out of focus picture are my cousins Los, his beautiful daughter Landrii, and our cousin, Denise, of whom I’m extremely proud. Just look how happy we are. We were giddy with delight that day when we finally met. This photo was taken in June 2011 at the Cumberland Gap Homecoming, coordinated by the Cumberland Gap DNA project members. Our Herrell family lived near the Cumberland Gap where we met face to face for the first time. A wonderful event, and Los drove from Louisiana alone with two toddlers to be able to attend. Bless his heart. (That’s the southern in me coming out.) Denise flew in from the west coast. Unfortunately, we live far apart but I can keep up with Los, his beautiful kids, and Denise electronically and via Facebook. And this is only the beginning of the “I Love My Cousins” list – it goes on – and I meet new cousins almost every day now. I’m amazed at how many people I’m related to, how large my extended family really is. Fortunately, love isn’t a limited commodity! Indeed, I’m grateful every single day for genealogy and DNA which connected me, and connects me, with my cousins. They pop up in the most unexpected places. Just this week, for example, I discovered when doing a DNA report for a client that I’m related to them, not once, but twice. My quilt group, related to 2 of 5 people. Someone I worked with on a special project a couple years ago, we recently DNA matched and discovered that we share a common Lemmert line out of Germany. And Yvette Hoitink, the Dutch professional genealogist I hired to help me with the Dutch records, yep, we’re related genetically on our mother’s sides. Reach out – you’ll find cousins too! You never know who just might be one. This entry was posted in Success Stories and tagged General Information by Roberta Estes. Bookmark the permalink. Very nice Roberta, thanks for that. I to am finding cousins but not finding where we are linked because of all the deceased members void. I have a particular problem because I can’t get my Paternal DNA side, I have no brothers and the 3 male cousins I have are not interested in getting tested. I am dead in the water, someone throw me a net. Is your mother living? If so, anyone that does not match you and her is from your father’s side. Thank you for sharing your story Roberta. I’m form a small family like yours, father only one sister and mother was an only child, so I share the longing for a big family. Both of my parents have passed on and there is only my sister (and maybe a brother who disappeared), and my self. I’m the only one that has kids. I’ve done 2 DNA test, with quite a few matches all 3rd and beyond cousins, but I’m still trying to make connections. About 90% of the matches have “Tenn.” in common, I know that my paternal grandfather was from there, so I’ll keep looking. Triangulate each person. Ask common matches if they match each other. If so, see if they know who their common ancestor is. If they do, then that would be your ancestor too. What is it with the male side of the family that they don’t want to be tested? I have two male cousins and one male cousin once removed and they just don’t want their “life” out there for all to see. They don’t understand and won’t listen to an explanation. So, I guess I am dead in the water too. Sometimes asking if they will do it “for you,” telling them you’ll pay for it, and making them entirely anonymous will do the job. Sometimes not. That’s a good American story. Great article, Cous! It really is amazing and sometimes I even find a cousin or two that I am realted to in multiple families. The first time I found this was a cousin from TX and we are related on my paternal surname line and my maternal side. Sometimes I will find cousins in Europe or Australia. It makes you think , “wow, DNA is worldwide”. What has really been a blessing is finding cousins that go back to a common ancestor 8-9 generations and sometimes you are the only genetic family they have ever known. 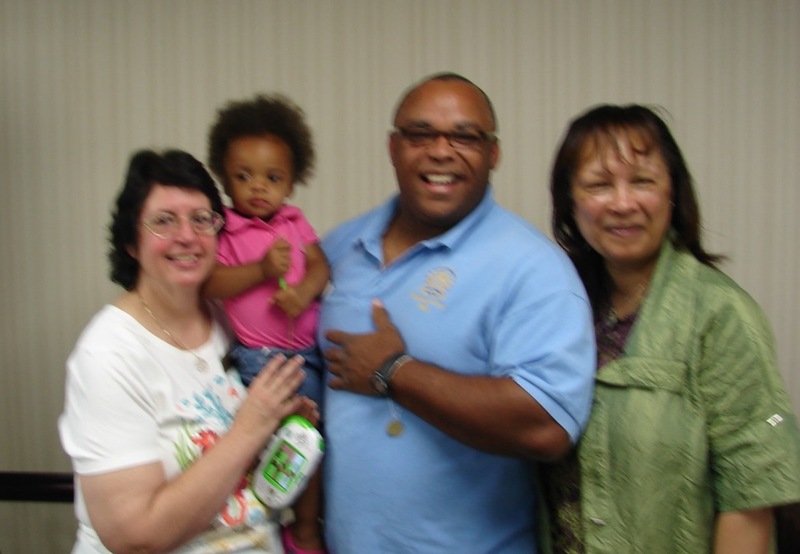 I was giving a DNA presentation one time, and a lady came to see me speak who was adopted but who matches me on DNA. She told me during question and answer who she was and why she came. She stood up and came up and took my hand and said she had never in her life touched another person she was actually related to. Made me cry. Made us both cry. Made most of the room cry. I’ll never forget it. Well, I am inspired to keep plugging away. Bob. Beautiful, heartwarming pictures. The story too…..very encouraging. Thanks! Last weekend I Y-DNA tested a black man who may be descended from my great-great grandfather. There was never a hint of this in our white family but the story was carried down in the black line and I believe it. The families lived near each other and had respect and affection for each other. Being in the upper south, I had some fear about how the elders of our white family would react but realized, at 79, I am an elder. I will be disappointed if this very nice man is not a cousin. Discoveries like this are much more common that one might think. I have several mixed race lines in my family and we are all shades of tan. We don’t see race anymore – just family. If your friend’s Y dna doesn’t match, test him autosomally as well. Surnames can be misguiding. I’ve only had one black, a young lady, contact me about a possible match. Our southern white family so far can trace several lines back 300 to 400 years always from the south. I think it would a wonderful thing to finally connect to our black cousins. If two families are from the same confined geographical area, the likelihood we’re related increases the farther we research back. At least in the south, I wouldn’t think the color of one’s skin would have much affect on these odds. I’d love to hear if any studies have been done on this. Finding living cousins is one of the great pleasures for me of doing genealogy. I’m met face- to face with a 5th, a 4th, several 3rds, and many 2nd cousins in the last seven years. Thanks for the great (as usual) article. Roberta – I was recently directed to your site by a ftdna site administrator, and I am so grateful for that! I just met my first DNA “cousin” in Red River, NM. Her brother a BRANDENBURG, matched my father, an ALEXANDER, likely within 7 generations. We’re having trouble getting her Ancestry.com Y DNA results transferred to ftdna to hopefully get us a little closer to a correct estimate. We are related by a very surprising NPE on my side. I’m hoping to find out when the “Event” happened in my family. Thanks for making DNA so human, easy to understand, and sometimes amusing as well! Susan (and Roberta), sorry to post 3 comments to this blog post. I don’t mean to be a hog with the replies but when I saw your comment Susan, I thought you might want to hear my experience. I too transferred my yDNA results from another testing company (SMGF) to FTDNA. FTDNA actually did a retest. They had me manually upload my yDNA test results from SMGF then send them proof of the SMGF test (a PDF that Genetree sent me). FTDNA analyzed the results of the retest and posted both results on separate pages. My FTDNA results are called “Y-STR Results” and are located under the Y-DNA section of “myFTDNA Home” page. My SMGF results are called “Y-DNA Advanced” and are located under the “Other Results” section of “myFTDNA Home” page. It took them 3 months, from January to April, to post the results of their retest. I grew very impatient at the long wait. I was very confused at what they posted on “myFTDNA Home” page until the FTDNA Y-DNA test results were posted. But I am sooooo glad that FTDNA’s team is thorough, accurate, and up-to-date. They’re so much better than everyone else. It takes them a while but they do respond to emails or phone calls. You’ll be glad you chose FTDNA to confirm your results. I didn’t get to the part about your Herrell family cousins Los (from Louisiana) and Denise (from the west coast) at the Cumberland Gap Homecoming. Instead, I immediately searched for the little X to close the screen……. You see, I’m a guy cringing because you said the L-word. I did (accidently) see the pics of you lovin’ your cousins. I read where your siblings are gone. Being the youngest of 3 brothers, I dread that day. We’ve already lost our grandparents, our parents, all our aunts and uncles, and my first wife died of cancer. So something got in my eyes when I saw you and your cousins. I think it’s just allergies but don’t tell the other guys, ok? Losing my siblings was really tough. I lost my sister in 1990, unexpectedly. Then Mom went in 2006, followed by both of my brothers last year from cancer. Three months later, my nephew, also to cancer. It was a really rough year. It’s kind of tough being the “last one standing.” I was the youngest, but not by much. And needless to say, my nephew was younger than me. So I really, really appreciate my cousins. Yea, those allergies, they get me too:) Your secret is safe. Thank you for sharing your story with us. It make me want to find as many cousin as I can. It truly is hard to lose loved ones. Is there a genetic chart like the on for the X chromosome for cousins and hopefully larger than the ones for the X on the internet or is there a way to make them larger so people with poor eyes can see them. Yes, in case you were wondering, it is I who has the poor eyes. I don’t know Tia. Maybe if they cam be made info a pdf document you can then enlarge the document as big as you want it??? Thank you, Roberta. Good idea. I’ve made two 4th cousins connections to my European family thru my Watson line and one thru a Lippert/Kost Line. I love going thru all this and learning more of myself. DNA is coming full circle, it took a lot of guessing out. Loved the post! I wrote a blog abt “Me and Pam”! my new cousin. Thank you for providing encouragement. Well you can “love” me too, Roberta. You match me at FTDNA as a proposed 4th cousin. My first thought is our match could be through out Webb ancestry. You seemed to have stopped short on that line, and I have too. If you ever decide to collaborate with Webb matches, count me in.